Reliance Industries and its partner BP Plc on Thursday won approval to invest $3.18 billion in R-Series gas field in the flagging KG-D6 block. RIL, the operator of KG-D6 block with 60 per cent interest, had on January 30 submitted the Field Development Plan (FDP) for D-34 field to DGH. Sources said DGH after examination trimmed down the recoverable reserves to 1.191 Tcf from 1.413 Tcf estimated by the operator. 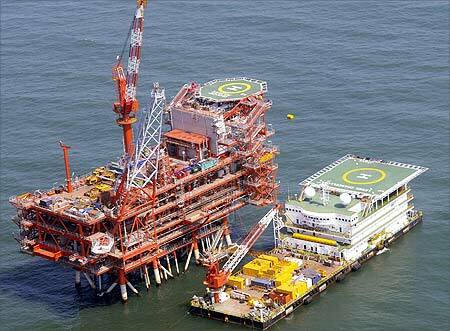 Also, the peak production of 14.9 mmscmd estimated by RIL was brought down to 12.9 mmscmd by DGH. The Dhirubhai-34 or D-34 gas discovery in the southern part of KG-D6 block in Krishna Godavari basin was notified in May 2007. The find was declared commercially viable by MC in November 2011.
commercially viable while the Declaration of Commerciality (DoC) of others has been refused in absence of DGH prescribed tests confirming the discoveries. RIL estimates that output from KG-D6 can reach up to 60 mmscmd by 2019 when all of the satellite fields are put into production. The MC had last year approved $1.529 billion investment in four satellite fields that can produce 10 mmscmd. Investment plans for rest are under consideration, sources added.